Posted By: Bry <bmulheran@gmail.com> Date: 5/5/11 11:08 a.m. Expanded a bit on the pics I posted in the topic about the Package the other day. People who follow my twitter will also have seen some samplings, I've just compressed things together a bit. Halo wise, the Scarab and Warthog have been added to the core chart. Second one shows how the Longsword compares to some of todays jets, including the worlds largest bomber (Tu-160), the largest airliner (A380) and the largest of all, the Ukrainian An-225 cargo plane which was built to transport the Buran, the Soviet Union's Space Shuttle, on its back. The Longsword really is enormous. The cabin is wider than that of most airliners and almost as long as the cabin of an Airbus A320 which can seat up to 180 passengers. 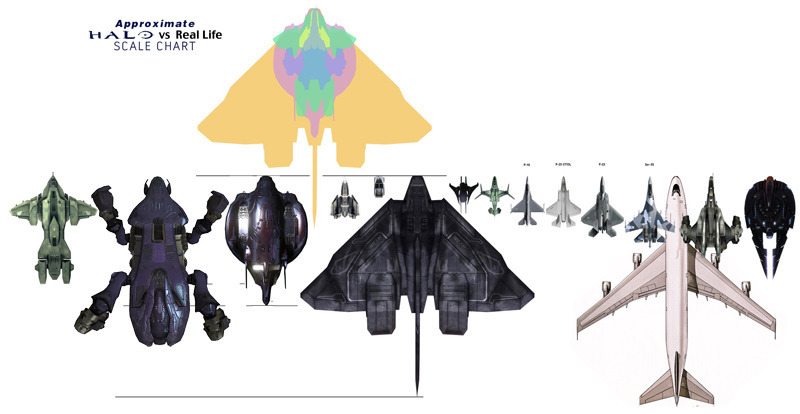 Updated Halo vehicle scales + vs real life Bry 5/5/11 11:08 a.m.
Re: Updated Halo vehicle scales + vs real life Revenant1988 5/5/11 11:17 a.m.
Re: Updated Halo vehicle scales + vs real life Bry 5/5/11 11:23 a.m.
Re: Updated Halo vehicle scales + vs real life Stephen L. (SoundEffect) 5/5/11 1:20 p.m.
Makes me wonder Revenant1988 5/5/11 2:31 p.m.
Re: Makes me wonder Stephen L. (SoundEffect) 5/6/11 6:14 a.m.
Re: Makes me wonder Leviathan 5/6/11 12:24 p.m.
Re: Makes me wonder Bry 5/6/11 2:08 p.m.
Re: Makes me wonder Stephen L. (SoundEffect) 5/6/11 6:53 p.m.
Re: Makes me wonder Bry 5/6/11 6:58 p.m.
Re: Updated Halo vehicle scales + vs real life Phoenix_9286 5/5/11 2:32 p.m.
Re: Updated Halo vehicle scales + vs real life Stephen L. (SoundEffect) 5/6/11 6:18 a.m.
Re: Updated Halo vehicle scales + vs real life Dielectric 5/5/11 3:09 p.m.
Re: Updated Halo vehicle scales + vs real life Stephen L. (SoundEffect) 5/6/11 6:29 a.m.
Re: Updated Halo vehicle scales + vs real life Dielectric 5/6/11 6:16 p.m.
Longsword Shop Bry 5/5/11 3:44 p.m.
Re: Longsword Shop Leviathan 5/5/11 7:21 p.m.
That could easily carry an ftl drive scarab 5/6/11 3:26 p.m.
Re: That could easily carry an ftl drive Bry 5/6/11 4:01 p.m.
Pics or it didn't happen ZackDark 5/6/11 4:40 p.m.
Re: Pics or it didn't happen Bry 5/6/11 5:17 p.m.
Wow. ZackDark 5/6/11 5:31 p.m.
Re: Wow. Bry 5/6/11 5:41 p.m.
Re: Wow. ZackDark 5/6/11 5:46 p.m.
Re: Wow. Leisandir 5/7/11 4:12 p.m.
Re: Wow. Bry 5/7/11 5:16 p.m.
Re: Wow. Leisandir 5/7/11 6:47 p.m.
Re: Wow. Bry 5/8/11 4:43 a.m.
Re: Wow. ZackDark 5/7/11 9:49 p.m.